Mary Michel was born in Clear Lake, Wisconsin and has been an artist as long as she can remember. 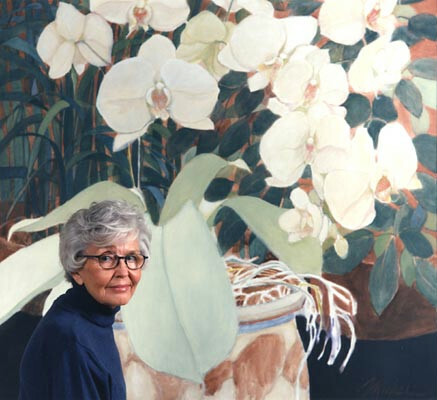 Known for her bold yet delicate paintings and serigraphs, her signature style was an elegant and refined technique. Her formal education began at the University of Minnesota where she studied fashion and advertising. She soon was offered an advertising job in the garment industry, which enabled her to segue into running her own advertising company. The Michel family visited Ventura in 1954 and soon made the seaside community their home. Mary began to work as an artist for the The Star Free Press. She completed her education in the arts at the University of California at Santa Barbara and the California Lutheran University. A tremendous asset to the community, Michel volunteered her fine art talents, design skills, artwork and support to help numerous non-profit organizations such as the National Charity League, the Boys and Girls Club, the Cancer Society and Project Understanding, to name only a few. A teacher at Ventura College for twenty years, Michel built a career on discipline, hard work and dedication to the community. Her work can be found in many private collection and in the municipal collection of the City of San Buenaventura. Mary Michel’s documentation took place in 1999. The FOTM Archive contains extensive information about this artist.